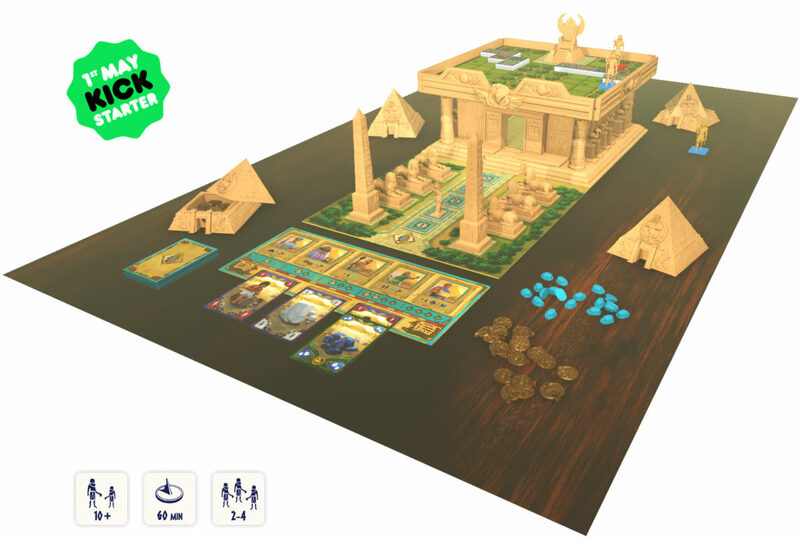 Cleopatra and Society of Architects is a fun and engaging game in which players compete to build a true three-dimensional Palace. Building the most magnificent and valuable parts of Cleopatra’s Palace will bring them great wealth. But if this is achieved by corrupt practices, the risk is to lose everything, even life… in the jaws of the sacred crocodile. 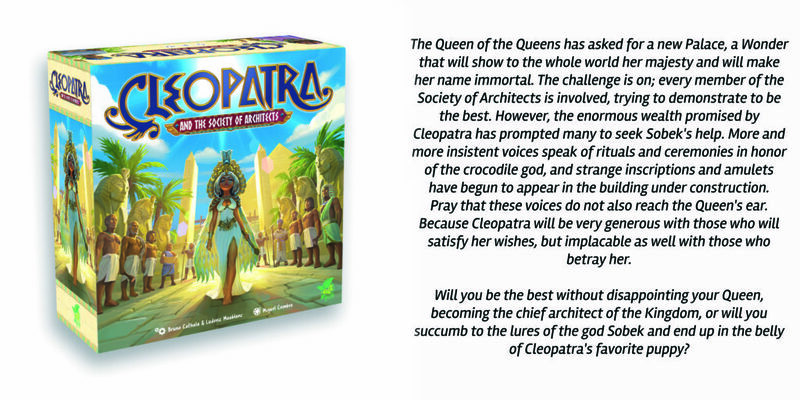 Cleopatra and the Society of Architects, designed by Bruno Cathala and Ludovic Maublanc, backs after 13 years in this new deluxe edition, with a renewed artwork by the famous and talented Miguel Coimbra, new rulebook updated by the designers themselves, in line with today’s game trends, and two exclusive expansions. 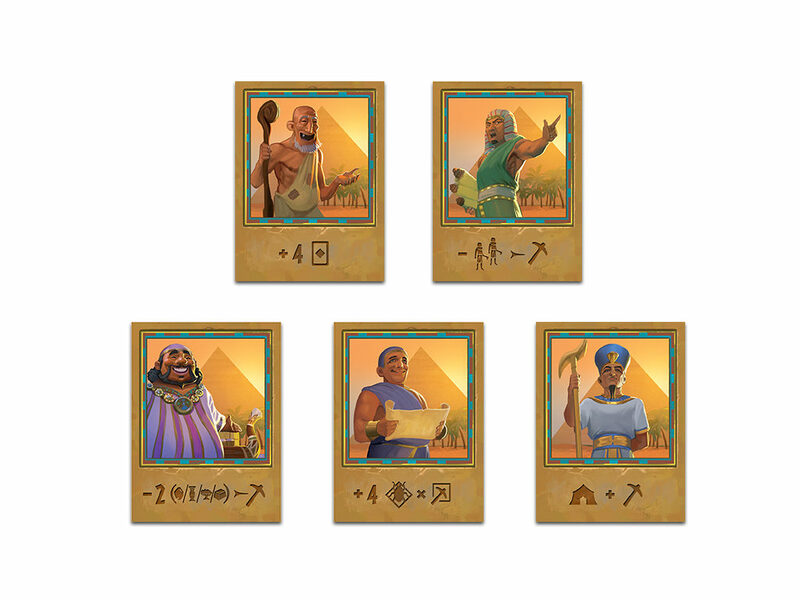 RESOURCE CARDS represent the resources required to build the palace of Cleopatra. 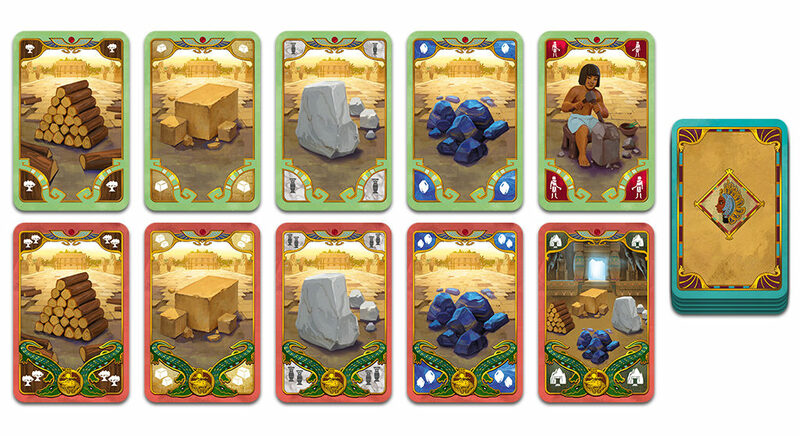 During her/his turn, the player can visit the Market and pick all the cards from 1 of the 3 Market stall (columns). The cards in the column may be face up or face down. Then, the player replenishes each Market stall by drawing the top three cards from the draw pile, and placing them, one at a time, maintaining the orientation of their faces (up or down), in the order of his choice. During her/his turn, the player can visit the Quarry in order to acquire the pieces of the Palace he would like to build. For building a piece, she/he discards from her/his hand any combination of Resource cards that matches or exceeds the construction requirements of the piece being built, earning the corresponding Amulets. The worshippers of Sobek are corrupted characters that may offer their services throughout the game. At any time during her/his turn, the player may also, if he/she wishes, ask for worshippers of Sobek’s help. She/He pays the penalty indicated on the worshippers of Sobek Board and then she/he places the used character in the last position of the board (on the right). They are very powerful but the price to pay is very high. So be careful not to abuse them too much! In the Pyramid of Corruption the player keeps hidden the Corruption Coins she/he receives during the game when she/he uses “tainted” Resource or actives the worshippers of Sobek. When an entire category of pieces (the Sphinxes, Obelisks, Throne and Pedestal, Door frames, Column walls, or Mosaics of the Gods) is completed, Cleopatra moves one space forward to the Palace’s door. If Cleopatra moves from 3rd to the 4th space of the walk, an offering to the Great Priest must be made. Each player puts in hand a secret amount of Amulets he wishes to offer up. Once ready, all players now reveal their offering and the most generous player discards 3 Corruption Coins from his Pyramid of Corruption. The other players instead receive other Corruption Coins (from 1 to 4). The Game ends when Cleopatra reaches the last (5th) step in front of the Palace doors. After assigning penalties for the accumulated corruption, the architect with the most amulets is the winner.